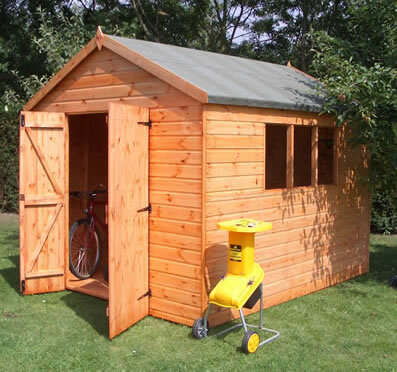 The traditional style garden Apex shed which makes an extremely good heavy duty workshop. Standard Double door width of 4', extra width of 5' if required. Windows of 18" x 24"
12mm T+G redwood shiplap side cladding. Options: Numerous options are available including extra or opening windows. Additional doors, double doors or stable doors, we are also able to offer extra wide doors if required. Barge boards and various security kits. As standard this building includes a 1 year rot resistance guarantee. As an optional extra we are also able to offer a premium grade topcoat which guarantees the building for 7 years. We are also able to offer treatment in a colour of your choice.